As we've stated before; we do not expect a government shut down. However, we do expect plenty of political posturing (chaos and anxiety) as we approach the deadline. In fact, the event might take us down to the last minute. After all, our friends in Washington have a knack for dramatics. In the meantime, the market will be reacting to headlines. This is not a time to be complacent. When the financial markets are tied to government headlines, things can get wild...be careful! Treasuries continue their slow grind higher as the once over-crowded bearish trade unwinds. Fresh longs seem to also be working their way into the market in anticipation of a possible (but not likely) government shut-down. Leadership issues in Italy are also enticing investors to seek quality. German Bunds traded at a six week high in overnight trade and the U.S. 10-year note is trading at levels not seen since late July. Thus far the bond and note rally has been civilized; yet, Treasury rallies are rarely such. While we acknowledge that a good chunk of the shorts have been squeezed out of the market we are certain there are more. In other words, there is plenty of room for panic. We are looking for the ZB to see 134'25 early next week, but if Washington really drops the ball 138ish is a possibility. The bulls and bears have spent a week fighting one another over the next move in the ES; unfortunately for them, neither is making much progress. Although we ended Friday on a weak note...it was a low volume end of the week session, so we can't put too much faith into price action. We are in wait and see mode going into next week. The market is at the mercy of the Fed. Some very smart traders we communicate with spent the day nibbling on long puts just in case we get a swoon going into the debt-ceiling deadline. However, they are also smart enough to know that being overly bearish at this price level with substantial event risk is a foolish venture...or at least it isn't a high probability trade so positions should be kept meager. From a charting standpoint, 1677 should act as the pivot. 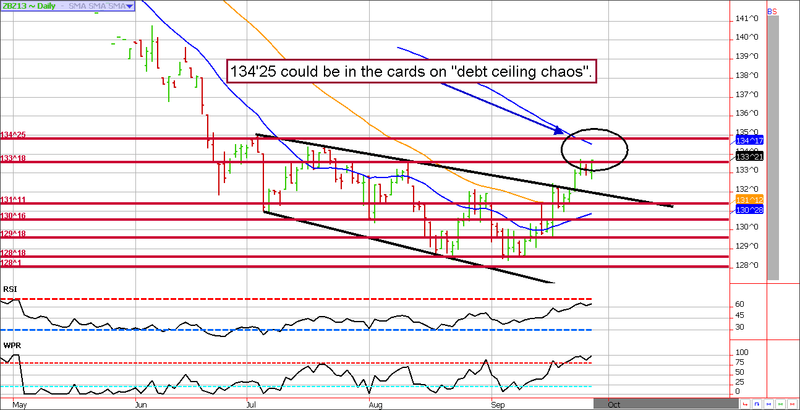 If prices hold above this level, the bulls have an edge but a break below could mean trouble. If the market slide below 1677, we'll likely see 1660ish in short order but the bears will be eyeing 1625 from there. **Consensus:** We are relatively neutral at current pricing. Until the ES proves it can rally from the 1677 support, or breaks decisively below it, we cannot justify being overly directional either way. That said, if the market opts to rally we'll be looking for a good place to get bearish. September 25 - Buy back any short ES calls, the 1730s are profitable by about $275 to $300 per contract for most traders before commission and depending on fill prices. Some were able to add on at better prices to sweeten the deal.